One in eleven Americans has diabetes. Are you one of them? Diabetes is an ever-growing concern across the US. With 1 of 11 people currently diagnosed with diabetes, we think that you should know the signs and risks associated with Diabetes. Have you been experiencing any of these signs? Combined with any of these risks? - Family History. Your risk increases if you have a parent or sibling with diabetes. - Diatary Factors play a large role in diabetes risk factors - learn more here. - Weight. The more fatty tissue you have, the more resistant your cells become to insulin. - High Blood Pressure is linked to an increased risk of diabetes. - For women, gestational diabetes and polycystic ovary syndrome raise risks. If you have had any of these signs and qualify with any of these risk factors and have not already talked to your doctor about your risk of diabetes, you need to make a doctor appointment. Diabetes can be a very scary thing if your new to it. But once you learn the causes and how to manage it, it becomes a normal way of life - meaning it's not so scary anymore. It has been learned that some people can even reverse type 2 diabetes by change of diet and lifestyle! 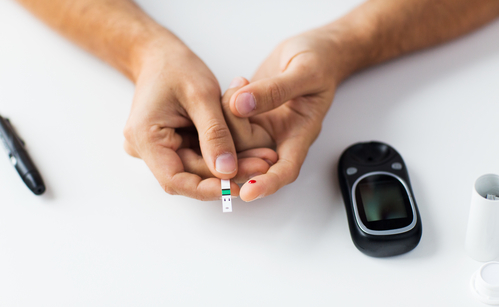 Sometimes you may not even have to be on medications to help control your diabetes. Testing for diabetes can be intimidating, we know. But understand, it's actually a pretty easy and relaxed process. Most doctors test by doing a timed A1C test. Meaning you fast overnight and usually show up in the morning. You will be asked to drink a sugary liquid and they draw small amounts of blood a few times throughout the testing process. It's non-invasive and relatively easy to do. The worst part is the fasting! Some doctors don't even have you drink the liquid, they just draw your blood after a night of fasting. It's a very simple process to prepare yourself for, so there are no excuses! If you have an elderly parent that shows signs of diabetes but refuses to get tested, what can you do? American Diabetes Association recommends that you educate those (including yourself) that may be at risk for developing diabetes. Together, you can learn about what diabetes means for them, their future care and health. And together, you can learn how to manage it! Untreated (managed) diabetes can lead to much more scarier things than a daily needle prick. There are many cases of people loosing their eyesight, limbs or even death from not managing their diabetes - and nobody wants that. Which is why it is important to educate yourself and talk to a doctor if you have any diabetic symptoms or risks. Learn more about diabetes including the signs, risk factors, types and management at www.diabetes.org. The American Diabetes Association also has a ton of support for those trying to learn more or receive support for diabetes.